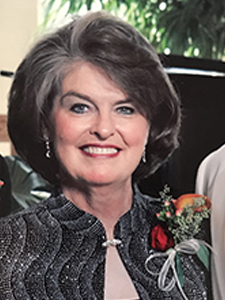 On Monday, November 12, 2018, Deborah Ann Forkins, age 70, passed away peacefully, at her home in Savage, MN, in the presence of her family. A time of gathering of will be on Friday, November 16, from 4-7 pm, at Ballard-Sunder Funeral and Cremation, 4565 Pleasant Street SE, Prior Lake and one hour prior to the Mass of Christian Burial on Saturday, November 17, at 11 am, at St. Michael Catholic Church, 16311 Duluth Avenue SE, Prior Lake. A private family interment will be held at Fort Snelling National Cemetery, Minneapolis, MN. Born in Minneapolis, MN on June 15, 1948, Deb was the oldest of nine children of Robert and Mary Ellen (Floyd) Pomije. The family lived for a short time in Minneapolis, before settling in New Prague, MN, where she spent her childhood. She loved time with family, including countless hours of fun with her cousins next door. She also loved traveling to Minneapolis visiting Grandma Floyd, going shopping at Dayton’s, exploring the Excelsior amusement park, roller-skating and attending the state fair. Deb especially relished holidays, including Christmas, which was always a magical time for the family. When Deb was 16 years old, she faced the biggest loss of her life—the death of her mother during childbirth. This event shaped her life drastically. Deb became a caretaker for her siblings and ultimately worked as an RN in high risk labor and delivery. Because she lost so much, Deb gave much in return during her life. Deb excelled at math and was a straight “A” student. After graduating from Burnsville High School in 1964, she worked 15 years as a Register Nurse. Deb met and married Dennis Levendowski. They were blessed with two sons, Darren and Brian. After parting ways with Dennis, Deb made the most of life for the boys. They enjoyed playing board games, especially scrabble or wizard. Deb and the boys particularly enjoyed the summer vacations with extended family up north. Wanting a new adventure in life, Deb began working in the real estate business. Within two months of working, she became the top realtor at the Realty Center. Deb had the personality to sell a home, especially to first time home buyers. It was here, her paths crossed with another realtor named Michael Forkins. They dated for a few years before exchanging wedding vows, on October 9, 1987 in Bloomington, MN. Deb and Mike partnered in business and the rest is history. They spent the next 21 years working side by side as realtors. In their free time, Deb and Mike were avid and passionate golfers, and enjoyed wintering in Florida for many years. They also loved to cheer on the Minnesota Gophers. One of Deb’s greatest joys was when she was with family. She had boundless love, loyalty and genuine compassion as a wife, mother, grandmother, sister and aunt. Deb was an amazing example to her family of how they should live their life with wisdom, grace and heartfelt consideration of others. No matter the situation, she was always kind, good natured and had a calm demeanor. Deb was the perfect grandma, wanting every child to feel special and loved. Deb assured the grandchildren’s Christmas’ were as great as hers growing up. Forever missed, Deb will remain in the hearts of those she loved the most, husband, Mike; sons, Darren (Rebecca) Hallin, Brian (Carrie) Levendowski; grandchildren, Morgan and Jackson Hallin; Mike’s daughters, Colleen (Barry) Flamm and their children, Matthew, Andrew, Dillon Flamm, and Kathleen Baker: siblings, Nannette (Jim) Greenfield, Richard (Cheryl) Pomije, Tom (Jane) Pomije, Sue (Clayton) Bosquez; many nieces, nephews, relatives and friends. There to greet Deb to her home in heaven is her mother, Mary Ellen Pomije; father, Robert (Jean and Beverly) Pomije; siblings, Sharon Olson, Arlene Pomije, Robert Pomije and Michelle Pomije. I am deeply saddened for your loss. Deb was such a loving force to all she cared deeply about that her absence will leave a void that will be impossible to fill. You loss is a profound one, a loss that I, and no doubt many others, also feel. Deb was smart, sharp and caring. It’s an understatement to say that she was family-oriented. It was obvious this past June she was determined to attend Aunt Helen’s birthday party and share in the joy even as her health problems were increasing, and I was thankful for the opportunity to sit with her for a while. Her life was inspirational and one for the rest of us to emulate. While the miles and the busy-ness of life caused our contact to be a bit infrequent, I always knew that Deb was not only a cousin, but a true friend. My heartfelt condolences to all of you. I am very sorry for your loss. Thinking of you and your family during this time.